The word "spam" is used on the internet to refer to unsolicited email often promoting pornographic websites, get-rich-quick schemes, or goods you can buy. Be careful with your email address, you don't hand out your telephone number to just anybody either, do you? One idea is to have more than one email address, the "main" one that you hand out to friends, business associates etc., and then another one that you use when for example a website requires that you enter an email address to download files. It is not uncommon to include the email address when creating a homepage on the internet. The following bit of HTML code makes it possible to click on a link and the email program of the user will open up with the "To:" field ready to send an email: <a href="mailto:send_me_spam@spam.org">email address</a>. Well, there are programs that the spammers can use to search for this HTML code and gather email addresses with. So including your email address like that will almost certainly mean that you eventually end up receiving spam. Spam email often tells you to reply to a certain email address if you do not want to receive email from that particular spammer anymore. Don't, that way the spammer knows that he/she has hit a real human email address. The same goes with retaliating against the spammer. It is not worth the effort. Often, the email address that the spam email seems to be sent from doesn't even exist, or it belongs to somebody else who has no fault in the spam being sent to you. This brings me to my last "tip". As already written, the email address that the spam was sent from often doesn't exist at all. Email servers are usually capable of performing what is called a "reverse DNS lookup" when receiving an email. This does increase the work done by the email server, but it also means that the email server will reject an email from an address that doesn't exist. If you are using an ordinary ISP email account, speak (or write) to the ISP about getting them to do this, if they can't or won't, choose a different ISP. I should forward a copy of the received email to 10 other people. I should add my address and within a few weeks I would receive, free of charge, Erricsons brand new mobile phone, yeah right. With the speed of email and with the above story in mind, that would probably bankrupt Erricson. Microsoft and Walt Disney were collaborating on an email tracking program, all I had to do was to forward the email to 10 other people and I would receive $1000 (I think it was). Well, even if true, would I like Microsoft to have an email tracking program that tracks emails no matter where they are sent from or to? A variation of the above email was only going to give me a small amount of money per user that I sent the email to, but I would also receive money for emails sent by those that I had sent the email to. I received the email in the month of March when apparently it was still going strong despite the fact that the email stated that one would only receive money for email sent before January. 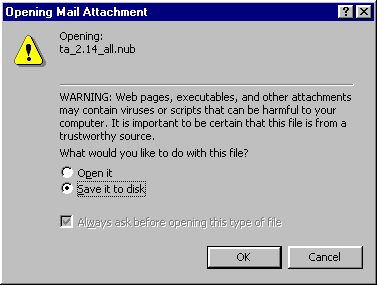 False virus warnings are often sent by well-meaning people as well. This bit will primarily be relevant to users of Intel based PC's running Windows, and with one exception (that I'll get to) is the truth about these nasties. You don't want them (I guess you knew that)! There is usually no need to be paranoid about them. They can't appear out of nowhere, and they can't get inside your PC by themselves. YOU (yes, you) have to do something that gets them inside your PC. You can access a file which either is a trojan horse, or contains a virus, on a floppy diskette or ZIP disk or CD-ROM. You can access a file which either is a trojan horse, or contains a virus, that came from the internet. Access is a very important word here. The mere presence of a nasty file on your harddisk, floppy, CD-ROM or in an email sent to you does not mean that you have to whip out that recent backup you have ready (you do have a backup, don't you?). A trojan horse has to be available as executable code. In "the old days" that meant that only files with the extensions .EXE or .COM could be trojan horses or contain virusses. But now we also have things such as "Visual Basic Scripts" (.VBS) and Word or Excel macros. But whatever form they appear under, they have to exist as CODE, not just mere data. And when YOU decide to run the code that contains the trojan horse or virus, you get bitten. Not before. So how do you run code? You doubleclick on a program icon in Windows Explorer. Within your email program you doubleclick on an attached file. Again, a program is a file with any of the above mentioned extensions. To be more "friendly" Windows usually hides the extensions of files on your harddisk. 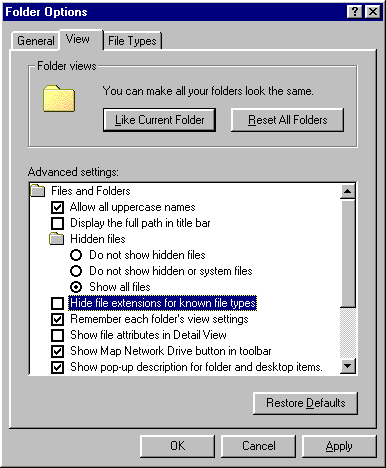 If you want to be able to see the extensions of files in Explorer (in Windows 98), choose "View -> Folder Options" and you will be presented with an option that says it all. Click on this link to see a screenshot of what it should look like. When I doubleclick on an attached file sent to me by email, I see this. That is not yet dangerous. Saving it to disk is not dangereous. Selecting "Open it" and clicking OK is. If it is a virus, it may now be time to restore that backup of mine.